A highly-stylized sink, tub, or faucet can be spectacular. Whether you want something vintage and colonial or sleek and modern, there is a broad range of styles and metal finishes to choose from. Adding bold new cabinet hardware can also be a showstopper. Instead of keeping all the walls a uniform color, choose one to stand out as an accent wall. You can do this with a paint color or tile design, but don’t be afraid to try something unconventional! 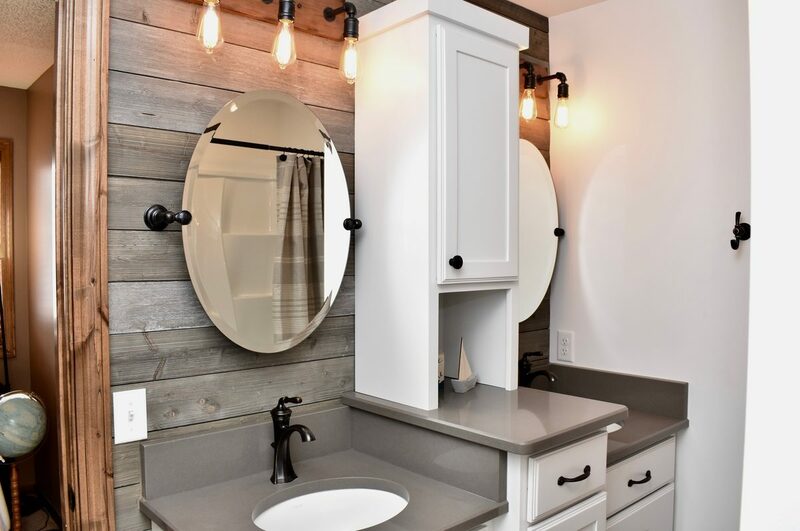 In a recent remodel, we chose to highlight the wall behind the vanity with wood to evoke a rustic style. Typical bathroom lighting includes an overhead fixture and a unit above the vanity, but depending on the size of the space, that may not be sufficient. Lighting enhancements can make a big difference in functionality and can even help smaller spaces feel larger. Swapping out your current bath for an updated feature can be a great investment. Think beyond an update as well; for example, if you currently have a shower, consider upgrading it to a shower and tub combination to make the space more versatile. One of the most dramatic changes you can make in a bathroom remodel is to the layout. It can require extensive plumbing work, but if it greatly improves the flow and spaciousness of your bathroom, you might find it worth the effort. For anyone in the Minneapolis area looking for a dedicated general contractor experienced in bathroom remodeling, EdgeWork Design Build can help. Whatever ideas or styles you wish to incorporate, we’ll work closely with you achieve them. Visit our website to see our work and learn more about our approach. Initial consultations are free of charge, so don’t hesitate to reach out!